You are about to start a new year, see new faces, welcome new challenges, and start once again on a one-year journey of student success. You are about to meet a child who will challenge you, push you, and may even go against the grain. You are about to meet a child who needs you more than you will ever know. You are about to meet a child who has failed more times than succeeded. You are about to meet a child who doesn’t get breakfast at home, and dinner is often a hit or miss experience. You are about to meet a child who already knows over half of what you are supposed to teach, but desperately needs you to push him forward. You are about to meet a child who doesn't understand how to make friends, communicate effectively, or work within a group...but is so amazingly smart. You are about to meet an overbearing parent, a parent who doesn’t want to hear from you, and a parent who will do anything to support you. Every child you meet in a few weeks will be different. Every child will have different needs, different goals, and different past experiences both good and bad. But here is the thing I need you to remember...every child you meet needs you, whether they realize it or not. Teaching is such a challenging profession....it's not a job, it’s a calling, and one that is not answered easily. 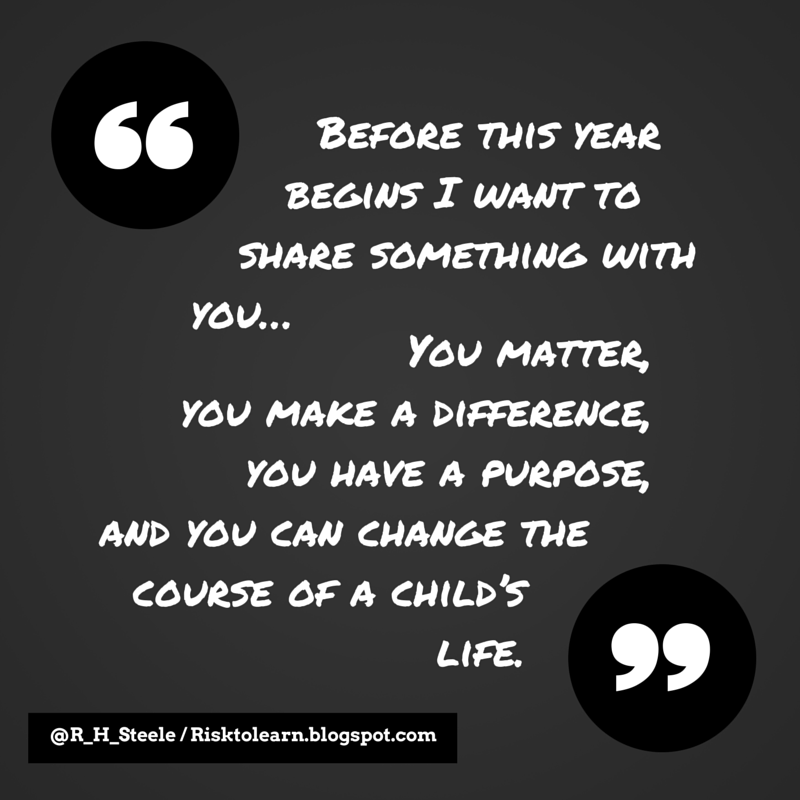 You matter, you make a difference, you have a purpose, and you can change the course of a child’s life. Think about that...how many professions afford the opportunity to change a life? But remember this...it can be for good or bad. One year makes a difference...A child who fails over and over again is likely to stop trying. A child who fails to move forward for one year is likely never to fully catch up. A child who feels unloved, unwanted, or unnoticed for one year is likely going to struggle finding self-worth in the future. Understand the power you hold...it’s not just about teaching the subject...its about making a difference in a child’s life. One year makes a difference...A child who feels loved every day for one year can build a sense of self-worth that will last a lifetime. A child who feels successful each day for one year can find self-efficacy that can sustain the trials ahead. A child who learns the value of working hard, persevering, and understands learning is about the process - not just the product, will build a foundation for a lifetime of success. I love and appreciate you. Teachers in all areas, paraprofessionals, custodians, food and nutrition services, coaches, and parent volunteers. I love that you chose to come to school and change lives, make a difference, and give children the chance to feel successful. I love that you work hard, tackle challenges, and refuse to give up when it would be easy to do so. You are about to meet many new children, children who need you, children who will love you, and children who will know more tomorrow because you worked hard preparing something new and exciting today. Let’s change the world one child at a time...and let's do this together. Your message to the staff is very meaningful. Thanks for reminding us, your staff, that we matter, make a difference, have a purpose, and can change the course of the lives of our students. Once the school year is under way and teachers are "in the trenches", we sometimes don't remember these things. So as our leader, would you mind continuing to remind us at certain times throughout the year? Thanks! Thank you for giving us such a good start to the new year, filled with encouragement and good advice. Some of these students are really hard cases and have such difficult lives. It is up to us to make them feel better about themselves and other around them. They are a gift to us. These words mean so much! Thank you for acknowledging the difficulty of this job and the worth of all school staff. I so badly want teachers to know they matter. Your words are so powerful! Thank you for being such an inspirational leader. This is so awesome. I would love to share this with my staff. These words are so true. I have taught for many years. There are many stories to share about students whom I worked with. Some are about academic successes. Most are stories about the connections and bonds I have made with students. There are many special imprints made in my heart by children who have come through Ridley School District. Quite simply, "Thank you, Ryan."